The Client Flow for authenticating apps consists of one transaction only and should be used for mobile applications. The application makes an Authentication Request to the Authorization server, and the server returns the access token to the application assuming that the Constant Contact user grants access to the app. The user opens an app on their tablet or smartphone. 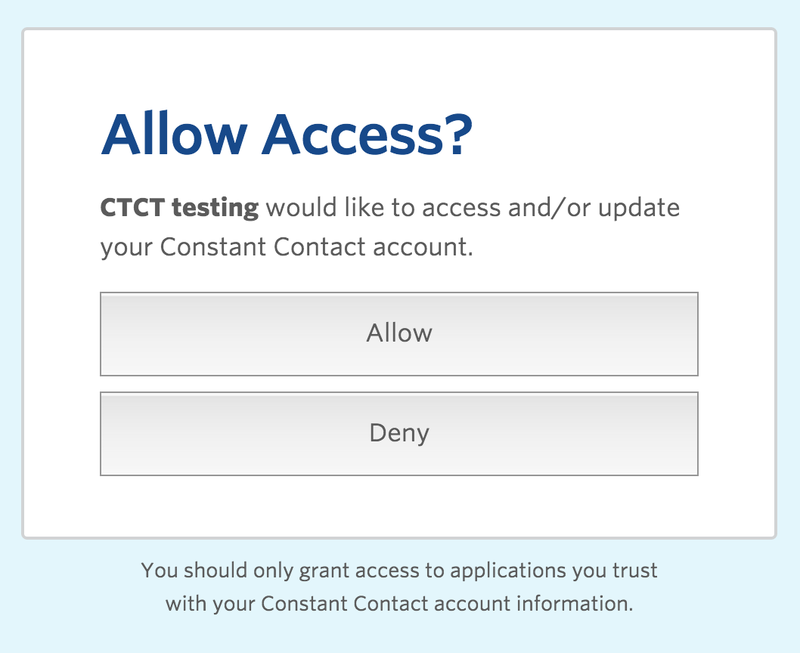 The application directs the user to the Constant Contact authorization server. The login screen displays, and the user logs in to their account. The authorization server redirects the user back to the client and includes the access token in the redirect URI fragment (see Access Token Response). An Authorization Request is formed as a GET call to the Authorize endpoint. always be token for the client flow. this parameter MUST always be set to the exact value of the API_key. Use newUser=true to send users who do not have a Constant Contact account to the account signup page. If the user denies the access request, or if the GET call is malformed in some way, the server returns one of the error messages described here. In an HTTP Header - this method is preferred as the more secure way to protect the token from intercept. NOTE: Every API call needs to include the api_key query parameter as shown in the examples above. You can see a simple example implementation of an OAuth 2.0 flow in PHP with instructions here.